Are You Losing $1000's Every Month Because Of Unreliable Email? ...Stop Leaving Your Success To Chance & Start Getting In Touch With 100 of Your Prospects & Customers Every Time!" How much extra money do you think you would make if every message you sent to your prospects got opened by everyone you sent it to every time? A guaranteed 100 open rate! Follow Your Prospects All Over The Internet Until They Buy Your Products! Let me show you exactly how 'Contact Automator' works. All you do is simply open the program, fill in a few simple options, and press "Build Application". 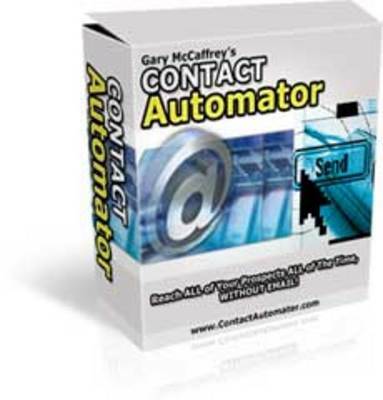 'Contact Automator' will create a file ready to distribute to your prospects and customers! Now anytime you want to bring them back to your website and sales message you simple update the page you entered when creating the file, and within minutes you're prospects will receive an alert direct to their desktop. Imagine having your own custom branded software on thousands of peoples computers selling them your products! You can start creating your personalized software now. $97? $67? Well no, its worth MUCH more than that! But since this is brand new, I have decided to test the water and price this product at just $6.95, not only that, if you're one of the next 50 people to order, you'll get an instant free upgrade to Master Resale Rights!